An environment for social occasions unparallel in the Middle East. With the character of a Mediterranean village clustered above the shimmering drama of the Red Sea, yet with the imaginative cuisine and intuitive, personalised attention of Four Seasons. Set in the natural beauty of Sinai, Four Seasons Resort Sharm El Sheikh offers 136 guest rooms, including 27 suites; 54 luxurious suites offer expanded space and enhanced amenities for friends, families and travelling companions. All guest rooms and suites feature a private balcony or terrace – most with stunning views of the sea. Designed for comfort and privacy, Panorama Rooms feature secluded terraces with elevated panoramic views of the Red Sea and the expansive sky. Designed for maximum comfort and privacy, Premier Rooms feature secluded terraces with views of the Red Sea and the Resort courtyards and pathways. Designed for maximum comfort and privacy, Deluxe Rooms feature secluded terraces with partial views of the Red Sea and the Resort courtyards and pathways. Designed for maximum comfort and privacy, Superior Rooms feature secluded terraces with views of the intimate garden courtyard. A luxurious, private residence with stunning views in all directions, the Resort's Royal Suite fosters a unique sense of seclusion. The suite features a peaceful courtyard surrounded by greenery that is ideal for alfresco dining, relaxing or entertaining. The two Presidential Suites provide additional space for living or entertaining. Enjoy the many amenities found in these suites, such as the private garden with swimming pool and terrace and the large living area. Located on the lower level of the Resort with its own plunge pool, the Ambassador Suite offers stunning and secluded views of Tiran Island and the Red Sea. The one-bedroom Tiran Suite offers stunning views of Tiran Island and the Red Sea. Deluxe Gezira Suites enjoy views of the Resort, the sculpted gardens and the Red Sea. These suites offer spacious accommodations ideal for travel companions, friends and families. They feature two spacious bedrooms, as well as a full kitchenette and a living/dining area. Superior Gezira Suites enjoy views of the Resort and sculpted gardens. These suites offer spacious accommodations ideal for travel companions, friends and families. They feature two spacious bedrooms, as well as a full kitchenette and a living/dining area. Garden Gezira Suites offer spacious accommodations ideal for travel companions, friends and families. These suites feature two spacious bedrooms, as well as a full kitchenette and a living/dining area. Serving an authentic selection of Italian regional cuisine, this stylish specialty restaurant creates an intimate ambience. The terrace dining area overlooks the Red Sea and a lovely courtyard with a fireplace and a fountain. Il Frantoio seats 46 indoors, 46 on an outdoor terrace, 30 in the courtyard and 14 in the private dining room. This open-concept restaurant offers indoor and alfresco dining in the Main Building. Guests may dine on Mediterranean, Moroccan and Lebanese specialties, while enjoying exceptional views of the Red Sea. The décor is Mediterranean/Middle Eastern. Specialties include Middle Eastern mezzeh and fresh seafood. Themed buffet nights are arranged weekly and focus on one of a variety of cuisines: Arabic, Asian, Italian, Mediterranean, carvery or seafood. Located on the coastal strip near the beach and overlooking the Red Sea, the Reef Grill offers a selection of local specialties, grills and barbecued items. At the main pool, a large dining area serves a selection of salads and Asian-influenced casual fare. Seats 126. The Observatory Lounge offers a relaxed, candlelit ambience with spectacular vistas of Tiran Island and the Red Sea. The lounge serves a variety of cocktails, special martinis and non-alcoholic beverages. The open-air Nafoura Lounge offers a sophisticated Arabic ambience. Guests can enjoy traditional Arabic mezzeh (Middle Eastern appetisers) and choose from 24 different shisha (water pipe) flavours. Live entertainment showcases Egyptian cultural with a belly dancer and other shows. Seats 40. A spectrum of indoor and outdoor venues accommodates meetings and special events of all kinds. Indoor meeting rooms open onto private terraces, and large outdoor areas are designed to take full advantage of the Resort’s beautifully landscaped grounds, the pool area and views of the Red Sea. Meeting facilities are private and secluded and are fully equipped for events requiring staging, entertainment, barbecues or other activities. The Resort's Spa and Wellness Centre offers a comprehensive fitness facility, including upright and recumbent bicycles, elliptical trainers, treadmills and free weights, stationed indoors and outdoors. The lap pool provides a welcome aerobic exercise in a relaxing atmosphere, with water sprinkling onto the pool surface from spouts mounted on the side of the pool. Guests who arrive prior to check-in time, when no guest rooms are available, or who have departing flights after the check-out hour, may enjoy full use of the Spa and Wellness Centre and the Departure Lounge. The heated free-form freshwater swimming pool is approximately 1,000 square metres (10,764 square feet) and has an outdoor whirlpool. It features a landscaped pool deck, island bar, private canvas cabanas, underwater music and views of the Red Sea. Food and beverage service is available between 10:00 am and sunset. Four Seasons Resort Tennis Centre is operated by Peter Burwash International, a highly recognised firm of tennis professionals. Four Seasons Resort pro shop provides for the needs of players at all levels, and also serves refreshments. Tournaments, private and group clinics and lessons are available. The Jolie Ville Mövenpick's unique design features include imported Bermuda grass and 18 man-made lakes, which attract a variety of exotic and endangered bird species. 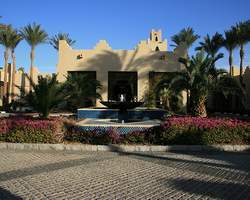 The course, conveniently located at the southern tip of the Sinai Peninsula, is only a 10-minute drive from the Resort. The Spa and Wellness Centre offers a comprehensive range of all-natural spa treatments and massages. Designed to meet the personal needs of each guest, the treatments promote relaxation, invigoration and renewal. The Spa offers 13 treatment rooms, including a couple's treatment room, as well as a sauna, steam room and relaxation area. The Spa also features a lap pool and fitness area. To help enhance overall body awareness and well-being, the Spa offers an all-encompassing yoga menu appropriate for all levels. In the tranquillity of the Resort's lush surroundings, with an exceptional view of the Red Sea, our skilled instructor draws on many yoga disciplines. Guests can participate in group sessions and private lessons, customised to their needs and preferences.